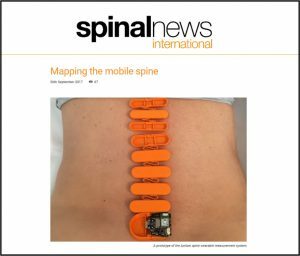 In its October 2017 issue, Spinal News International, the international newspaper for spine specialists, featured an article about 270 Vision, the inventors of BPMpro and BPMpathway technology, developing wearable technology, the BPMpro Spinal Module, for tracking the spine outside of the clinic setting. The article highlighted the Company’s pioneering Research and Development, that Martin Gossling, its Chief Executive Officer, had presented at the NSpine Main Conference 2017, explaining how meaningful 3D kinetic data gathered by the Spinal Module at the site of injury could benefit clinicians dealing with post-trauma assessment and recovery. Despite the lumbar spine being the site of over 20% of injuries in Olympic sport*, the spine is not scrutinised on a regular basis in the same way, for example, the knees and ankles of footballers often are. These high impact injuries can cause enormous trauma to the spine, in a group whose physical fitness is paramount. Assessing spinal movement can be an important tool in understanding the nature of these injuries and in aiding treatment and rehabilitation. The Spinal Module offers clinicians the opportunity to comprehensively and unobtrusively measure the movement of the entire spine in both athletes and the general patient population. The Company is developing the Spinal Module to map the spine across all levels in the sagittal, axial and coronal planes based on its world-class orthopaedic measurement system BPMpro (BPMpathway). Using high performance accelerometers to map relative to the vertical plane, gyroscopes to measure 3D movement and ultra-precision magnetometers to track the degree of twist — all in three axes — a precise measurement of movement should be possible to less than 0.1 of a degree. The technology is currently making its way through the UK patent application process, incorporating elements of 270 Vision’s granted patent on the assessment of human movement using motion sensors.